Above, the male is shining greenish-blue and the female is paler purplish blue. Both sexes have a broad apical black border, hindwing black at costal border with its inner edge evenly curved to below vein 6 in male and to vein 4 in female. The female has additional marginal spots at tornus and in spaces 1b, 2 to 4. Beneath, both sexes are drab greyish-brown and are whitened at dorsum. The forewing post-discal line is much closer to termen than to the cell-end. The large black tornal spots in spaces 1a and 2 on the hindwing are broadly orange-crowned. Each hindwing has a pair of white-tipped tails at ends of veins 1b and 2. 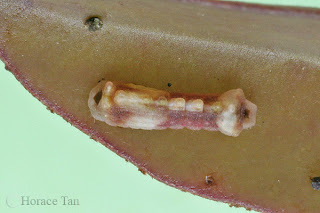 This species was recently re-discovered in Singapore in 1999. It is relatively rare locally. 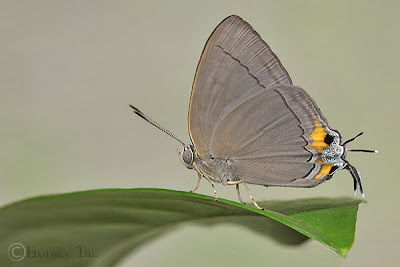 Sightings of this species have been more frequent in the Southern Ridges than in the Central Catchment Reserve Area. Around noon, the fast-flying adults have been sighted taking nectar at flowering plants in hill parks. At times several adults could be seen flying at tree-top level in the mid afternoon. 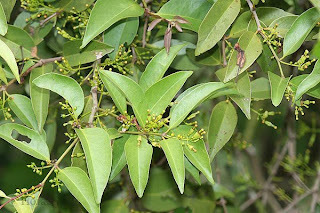 The host plant, Macrosolen cochinchinensis, is a parasitic shrub with all parts of the plants glabrous (having no hairs, smooth). The leaves are leathery, opposite, ovate or lanceolate. 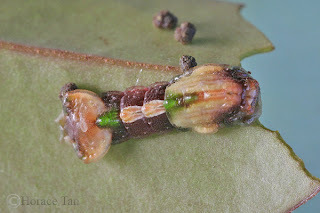 The early stages of the Felder's Royal feed on the young to mid-aged leaves of this parasitic host, with the 1st instar initially skimming the leaf surface and the later instars eating the leaf along the edges. 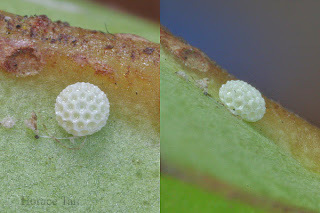 Eggs are laid singly on underside of a leaf of the host plant. Each egg is white, circular and covered with rather large hexagonal pits. 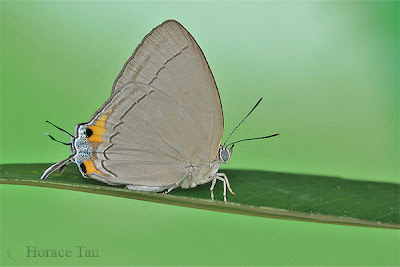 The size is relatively large for a lycaenid species with a diameter of about 0.8mm. It takes 3 days for the collected egg to hatch. The young caterpillar consumes just enough of the egg shell to emerge. With a length of about 1.3mm, it is mostly white with light brown to yellow lateral bands. Long setae (hairs) run along the length of the body dorsally as well as sub-spiracularly. The caterpillar assumes the typical woodlouse body shape as it grows in this instar which lasts about 3 days and sees the body length increased to about 3mm. 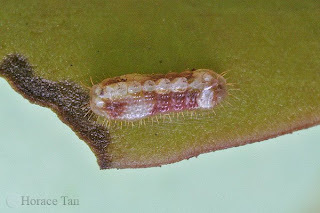 On the last day of this instar, raised dorsal tubercles become prominent and reddish brown patches appear laterally. 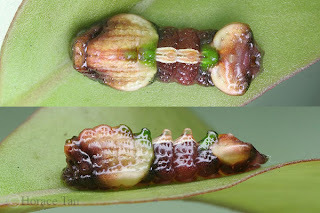 The 2nd instar caterpillar is an enlarged version of the 1st instar caterpillar prior to the moult. It has a diamond-shaped prothoracic shield dark in color. Dorsally, it bears prominently raised dorsal tubercles, one to each of abdominal segments 1 to 6, and two to each of thoracic segments 2 and 3. Reddish brown and pale patches decorate sides of the body. The posterior segments from the 7th abdominal segments onwards are fused together to take on a shield-like appearance with a dark patch sitting on top of it. 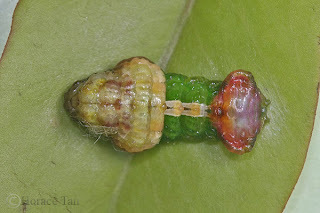 The 2nd instar lasts for 3 days and reaches a length of about 6mm. As it grows in this instar, the rather distinctive caterpillar appears to consist of three main parts. First, the anterior segments up to the 3rd abdominal segment forms a carapace-like shield, colored beige with reddish brown shading to the front. Second, the posterior segments from the 7th abdominal segment onwards are beige buff and have a shield-like shape. Lastly, the segments in between are dark reddish brown laterally. The dorsal tubercles are colored beige with light brown shading with the exception of those on abdominal segments 2,3, and 6 which are green in color. Even in this early stage, the dorsal nectary organ and tentacular organ are very prominently featured on the shield-like posterior. 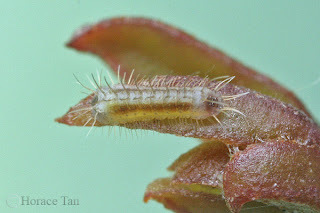 2nd instar caterpillar, late in this stage, length:6mm. The dorsal nectary organ and tentacular organs are visible. 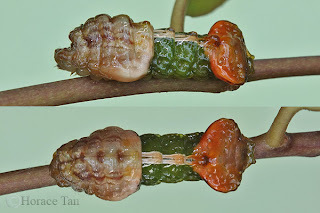 The 3rd instar caterpillar looks similar to the 2nd instar caterpillar in the day prior to the moult with the three-part appearance described above. As the body grows in size to a length of around 10mm, the color of shading on both the anterior and posterior parts also darkens. After 3 days in this stage, it moults again. 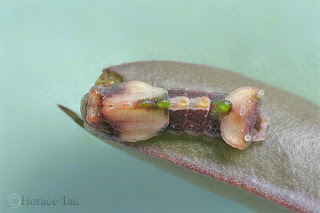 The 4th (and final) instar caterpillar initially resembles the 3rd instar caterpillar in the day prior to the moult. Over the next 2 days, the color of the body gradually darkens such as the mid segments become dark brown in color, and both the anterior and posterior segments are dominated by brown shadings. The carapace-shield also features a wrinkled surface. Furthermore, the dorsal tubercles on abdominal segments 2, 3 and 6 lose their green coloration and take on the same pale yellowish brown of the other dorsal tubercles. 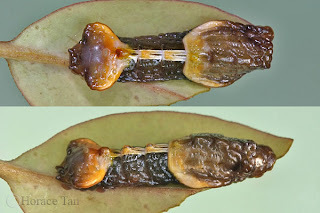 The 4th instar lasts for 4 days and the body reaches a length of about 19-20mm. In the last day of this stage, more dramatic color changes take place. 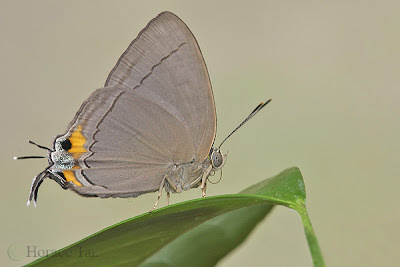 Now, the shield-like anterior segments take on a bright orangy brown coloration where the mid segments assume a contrasting dark green coloration. The carapace shield also becomes lighter brown in coloration. 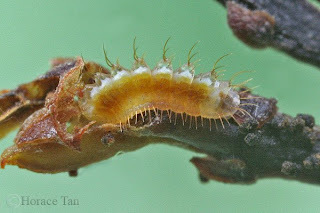 Nearing the end of this instar, the caterpillar ceases feeding, and its body shrinks in length. Soon it comes to rest on the leaf surface and becomes an immobile pre-pupa. The pre-pupatory caterpillar prepares for pupation by spinning a silk pad to which it attaches itself via cremastral hooks. 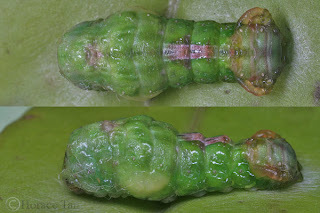 Even during this pre-pupal stage, color changes continue to take place with green becoming the dominant color during the 1-day pre-pupal period (see the next two pictures). Finally after 14 days of larval growth, pupation takes place. 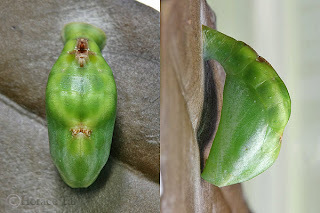 The pupa is held firmly via its cremaster to the silk pad on the leaf surface. It is 12-13mm in length, mostly green with yellowish green patches, and has two sets of brown to reddish brown dorsal markings. The pupa was observed to react to an external disturbance by jerking up and down. 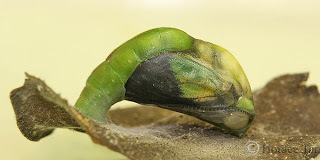 Seven days later, the pupa becomes darkened in color signaling the imminent emergence of the adult. The wing pattern on the forewing upperside becomes visible through the now transparent pupal skin. The next day the adult butterfly emerges from the mature pupa.